Do i have a real tracking number from ems??? Please Help! the shipping company needs about 3 days to update the status,normally you will get the item in 7-9 days,please let me know if you have any questions!Your patience will be highly appreciated !" If someone could verify thisI would grateful THANK YOU! 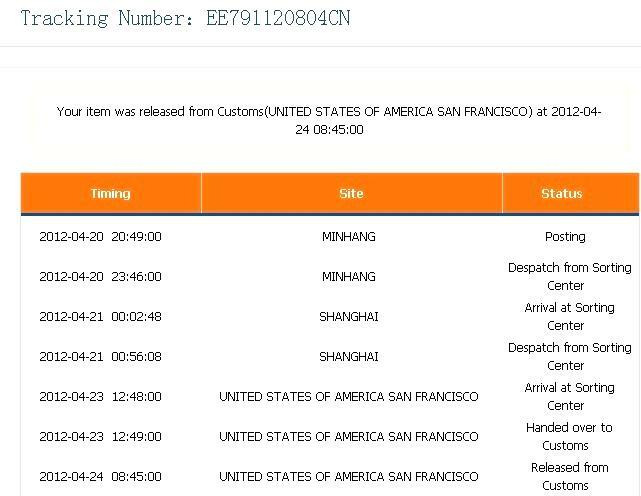 GUEST738W3 Couldn't find anyhing about your tracking number. When did the seller send out your package? I found the tracking information for you. Pls check if it is ok for you. Yes, it's real. It was sent to Auckland from Beijing at 2012-08-10 13:29:43. It was handed to the customs in Coventry at 2012-08-01 14:00:00. Post a Reply to: Do i have a real tracking number from ems??? Please Help!